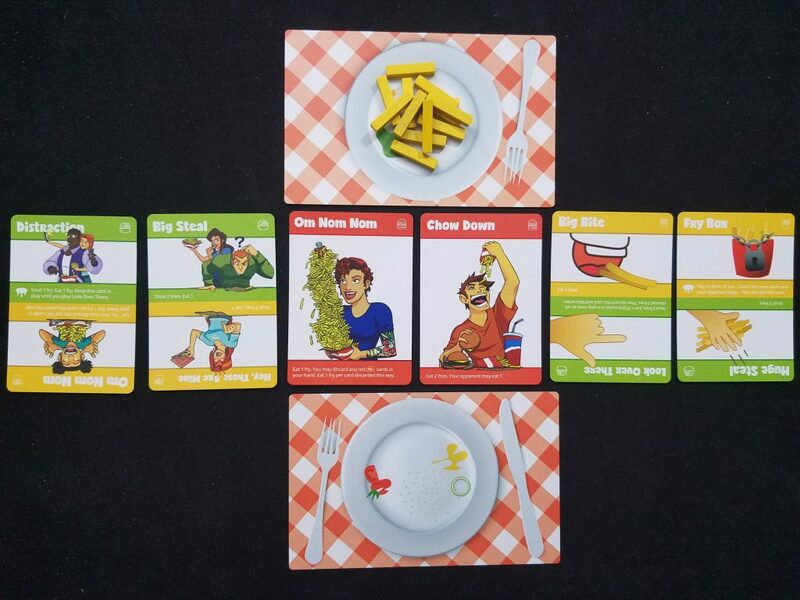 Fry Thief is on Kickstarter until 2/24. Check it out! I have never seen a game with a more relatable theme. You’re at dinner and your partner has ordered a burger and fries. In a moment of health-consciousness you got a salad. Now you’re done with your leaves and you’re staring down a warm, salty, golden-brown pile of fried potatoes on the other side of the table. You must have them. You shout and point and steal a couple of fries as they look around, bewildered at your sitcom antics. That won’t work again. Next the stealthy maneuver–trying to sneak one from the plate during conversation. They see you. The spud war has begun. I deeply relate to this scenario, both as the thief and the victim. Fries are no laughing matter, except when they are, like in Fry Thief, the first design by Patrick Rauland. It’s a simple, quirky 2 player card game that works as an inoffensive, humorous 5-minute distraction. One player starts with all of the fries, and the other begins with a plate of salad scraps and regret. By playing cards, the players will steal fries, dip them in ketchup, and eat them. Only eaten fries are safe from prying hands, and ketchup-dipped fries are worth bonus points. The cards are simple, but varied, especially since the spectrum of basic actions is so limited. There are cards that counter others, draw additional cards, prevent certain actions, and take/eat any number of fries. It’s certainly not revolutionary, but it is competent. Decisions are usually between a couple of decent options, but you won’t be wracking your brain at any point during the game. The fun of Fry Thief is entirely thematic. Each card has some kind of humorous ruse on it, from “Om Nom Nom” to “Sad Puppy Eyes”. If you’re not bought into the idea of laughing along with these cards there’s not much left to keep you interested in Fry Thief. Fortunately for me I found it quite amusing. That’s not to say there isn’t any strategy, because you’ll be running through the deck at least twice during a game, and planning around known cards can certainly play a factor in your decision making. Will you save that “Swat!” card to prevent them from stealing more fries, or eating them, hoping you’ll draw into a steal card next? Will you try to hoard red cards in anticipation of the one that synergizes with them, or go for the short term gain? Is ketchup worth it, or does it slow down your tempo? But such decision making is light as the breeze and as frivolous as, well, a french fry. If you buy into the theme you’ll have a pleasant 10 minutes with Fry Thief and its silly art. It’s good for a smile and a chuckle, a distraction and a quick bite.